DATE/TIME: Tuesday, August 21, 2018 10:28 p.m. 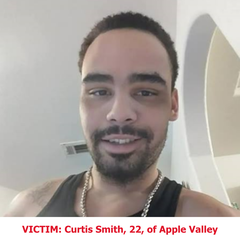 Homicide Investigators would like to thank the public for their assistance in the murder investigation of Curtis Smith. NEW Information has been received, and interviews have been conducted regarding the possible identity of the suspects involved in this murder investigation. Sheriff’s Homicide Investigators are conducting the investigation. Investigators are asking anyone with information regarding this shooting to contact the Homicide Detail, Detective Bruce Southworth at (909)387-3589. Callers can remain anonymous and contact WeTip at (800)78-CRIME or www.wetip.com. Through investigation, homicide investigators have learned the victim, Curtis Smith, was shot during a robbery at the incident location. The suspects have been described as two black males in their twenties. 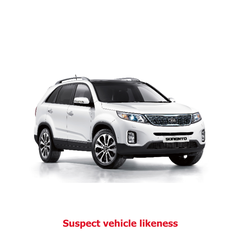 The suspects are believed to have fled the location in a white SUV similar to the vehicle posted. 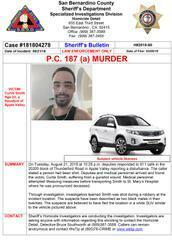 On Tuesday, August 21, 2018 at 10:28 p.m. deputies responded to 911 calls in the 20200 block of Thunderbird Road in Apple Valley reporting a disturbance. The caller stated a person had been shot. Deputies and medical personnel arrived and found the victim suffering from a gunshot wound. They attempted life-saving measures before transporting the victim to St. Mary’s Hospital. The victim was pronounced deceased at 11:03 p.m.